Nach der ersten Single “That´s Love” folgt jetzt endlich auch das erste Video aus dem neuen Oddisee Album “The Good Fight” (VÖ: 15.05.2015 / Mello Music Group). Oddisee gehört für mich zu einem der unterschätztesten Produzenten und MCs mit sehr guten Live Qualitäten! Hoffen wir, dass er dieses Jahr wieder in Deutschland auf der Bühne steht! “CounterClockwise is about being there for people & them working against you as a result. 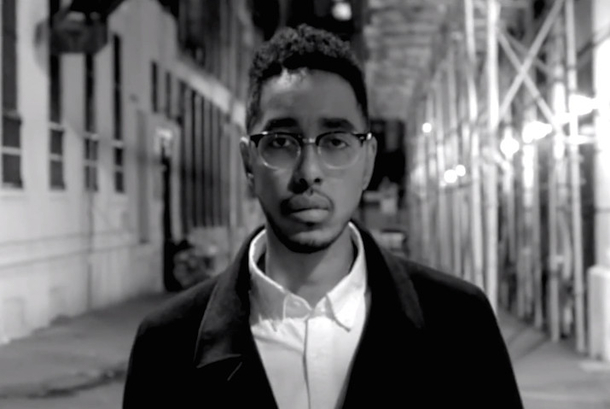 Becoming the bearer of their problems because they know you can handle it,” Says Oddisee. This is the second song from the Brooklyn by-way-of Prince George’s County musicians upcoming solo album “The Good Fight.” The song explores the counterproductive nature of some relationships that end up draining those involved. Disorienting and complex layers of backsliding record slips, driving drums, and haunting vocalizations push the song forward while Oddisee’s crisp and calm vocals tell the story of people moving in different directions. And while anger may be somes primary drive, and fire may be their weapon, Oddisee reminds us that water is their easy match. In order to visually represent this idea director Brandon Black and Director of Photography Zack Schamberg filmed Oddisee walking backwards throughout multiple boroughs in New York over several nights. Then they reversed the footage to make everyone else move backwards. Next the director shot the footage at night but boosted the light to appear as though it was day in order to add to the disorienting affect, making night seem like day, and forward seem like backwards.